One of the best things about travel is the escape it offers from the everyday routine. You have the freedom to make your day any way you’d like. Still, there might be some things about your regular routine you’d like to hold onto. So how do you skip regular bath time and chores, but keep your fitness plans when traveling with the littlest (and not so littlest) ones in your family? Here are some ideas to try. Take a hike – No matter the season, there are beautiful places to walk, hike or climb. National parks, trails or even rock climbing walls and ski slopes will keep you moving. 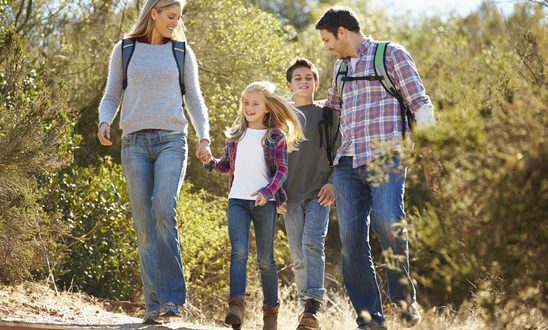 These combination fun/fitness activities are great for calorie burning as well as family bonding. Stay where you play – Look for off season hotel deals that allow you to affordably stay right in the thick of things. Accommodations near the attractions and restaurants you will be visiting make it easy to ditch the car and walk. As you plan your vacation, keep walkability in mind. Walking to wherever you want to go is an easy way to get in some exercise when you travel. Many towns also offer bike rentals just for getting around or as part of a tour. Sign up or rent and get rolling. Take a dip – Swimming is an easy and fun way to get in some exercise. The whole family can join in so you won’t feel like you are taking away from family time to stay fit. Take a few minutes in the morning – Take just 20 minutes in the morning to knock out an online fitness video. Get that in before anyone gets up so you can cross exercise off of your to do list before the kids hit you with their own list of plans for the day. Ask the concierge about run routes and onsite childcare so you can get in a good run while you leave young children in good hands. That said the best way to keep exercising when traveling with kids is to include movement in all the activities you are already planning. Look for creative ways to keep moving. Take the stairs as often as you can and use your pedometer to earn extra (nothing extra unless you reach 10,000 steps) vacation food treats. 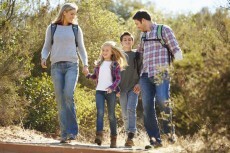 Decide as a family that fitness is important and commit to including physical activity in your vacation plans.